This is too often the sound heard in the last kilometre of A4 events. Limping cyclists and scraped elbows hips and knees for some is the outcome. This is not the best result for any bike rider, but especially not for someone who is just racing for sport. There’s also the possible negative impact of time lost from work, cost of replacing equipment, especially for people with families to support. So try to finish the race with all your skin and bike intact by following some simple guidelines. The final couple of kilometres is often where the highest speeds are achieved. The adrenaline is flowing and riders are at their most focussed and aggressive then. First of all, if you haven’t trained with a cycling club, raced in club races or are not sure of your fitness or skill level don’t get involved in the bunch finishes! to stay safe Move to the back of the bunch with a few kms to go, or maybe this is a time when you could make a last ditch attack off the front . All or nothing out the front or out the back!! If your fit enough you can still have an enjoyable and challenging race by trying to break away from the bunch during the race. Combine with some other non sprinters to make an aggressive race. The pattern seems to be that the A4 bunch chases down the breakaway attempts. This can be overcome by a strong group of riders riding strongly and persistently when they do open a gap. If the breakaway is strong enough and persistent they can open winning gaps. It sometimes looks easy and is always very exciting when we look at the pros sprinting on TV. However they have spent years learning those skills. If you have come into cycling from another sport the chance of you having anywhere near the level of skills required for high speed bunch sprints is very low. However you could improve them over time with a progressive approach. So leave the more experienced riders to it and it will be safer. Get experience at club level through training sessions or club races before getting stuck in to the big bunch sprints in open races. This will be best for your own and everyone else’s safety. Look where you are going at all times. Anticipate what’s happening further up the road, like oncoming traffic, narrowing road, parked cars. If you are not fit enough don’t get involved as rapidly decelerating riders coming back through the group is dangerous. If you blow up in the sprint, get out of the way of faster riders in a safe manner. Be aware that there is race traffic and that other cyclists may be finishing seconds or minutes behind you so be careful to avoid stopping too close to the finishing line. Avoid doing a U-turn to go back to the judges to find out where you might have finished in the race. Cooperate with the race organisers and help them to clear the finish area. They usually have enough to be doing at the finish without being distracted by riders who have finished. 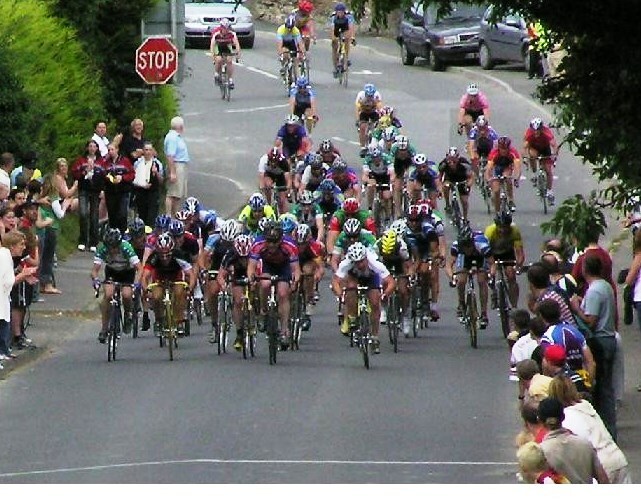 This is especially dangerous when a group of riders stop just beyond the finishing line and block following race cars, which then become a serious hazard to other riders sprinting in to the finishing line. For cat 4 and 3 races try to finish them on slightly uphill sections of road. This will slow the finishing speeds and minimise the injuries if riders do fall. Encourage riders to ride safely, especially to ride a straight line in sprints and always to keep their head up and look where they are going. Have a safety check before every race especially of the finish and run into the finish. Bear in mind that riders in 4-3 categories bunches will have more riders who are less experienced so the run in to the finish. and the finish need to be extra safe and not too technical and preferably uphill.